For the past few months, for most of Doctor Who season 8 actually, there has been talk that Jenna Louise Coleman, who plays the Doctor’s current time travelling companion on the long-running BBC sci-fi adventure, might be leaving the series. Specifically, we’ve heard that the upcoming Christmas special could be the last time fans see her. (In this role, of course, she’s not dying or anything. In reality, we’ll probably see her more, as one of the reasons she reportedly could leave is because her Who shooting schedule was too busy and kept her from taking other roles.) 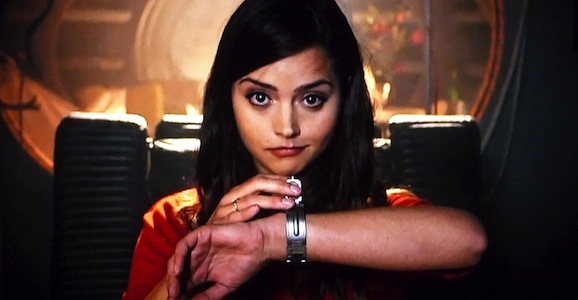 But as season 8 wrapped up, and the Holiday approaches, Clara’s fate has become increasingly unclear. One rumor was that Clara was going to grow old with the Doctor and then die in the Christmas special, which is a festive and merry way to spend the holiday. If she stays around, however, this is obviously going to have to change. It’ll be interesting because, as we recently learned, Capaldi has signed on for season 9 of the revamped Doctor Who, but we haven’t heard anything about Coleman inking a new deal. I admittedly haven’t watched all the way through season 8 yet, but from friends who have, the finale is reportedly fairly conclusive about this being the end of the Impossible Girl’s adventures with the Doctor. Then again, when you can travel through space and time, some things are possible that you don’t normally expect. Basically, for all of this talk and this back and forth, we still have no idea whether or not Clara will be in the picture beyond Christmas Day. And that’s just fine. We’ll get to sit down, tune in, and find out for real, and either way, it’ll be a surprise. How do you feel about this? Are you ready for Clara to move on and for someone else to start tagging along? Or would you like to see her return and have her character continue to grow and develop? Clara has a bun in the oven. She’ll be sidelined but not gone.